The wonderful thing about the Poster Art of Disney Parks book is the perspective and detail that these attraction posters bring. The fact that these three posters each represent the same attraction in their respective parks, but each one has an entirely different feel to them. The US park poster, with the traditionally styled characters and wonderfully ornate borders. 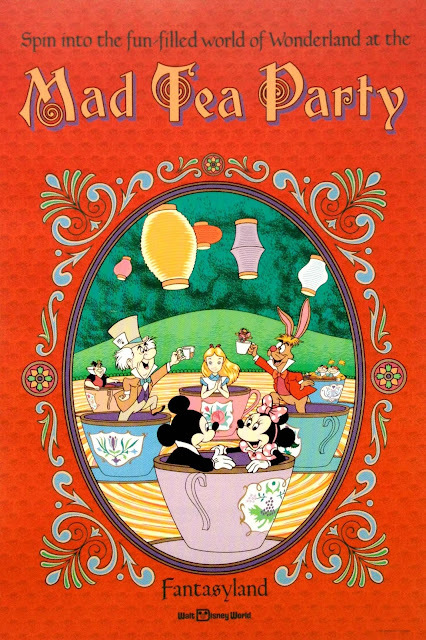 This might have been the poster that started my obsession back in the day, though I'm not sure why now...as I kind of think its ugly in regards to most other attraction posters. 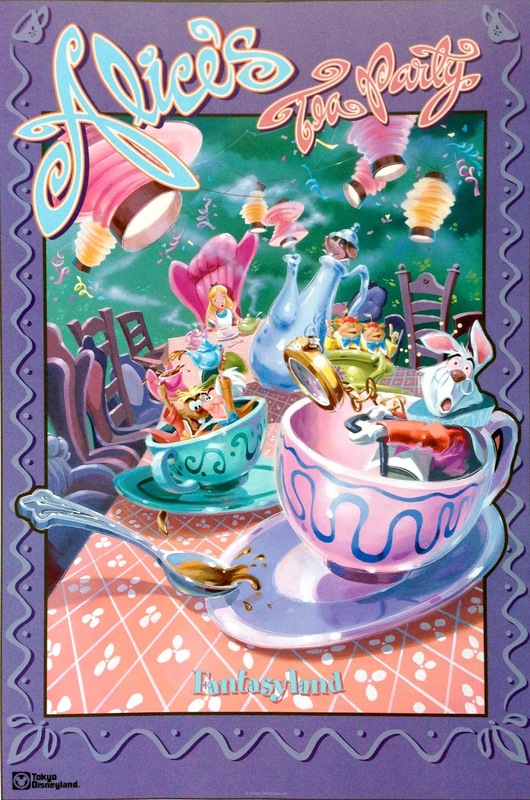 Where the Hong Kong poster's gorgeous flat pastel caricatures of Alice and friends portrays the terrific whimsy of the attraction flawlessly. Perhaps the most odd of the bunch come from Tokyo Disneyland. A moody and manic piece set right in the scene from the movie. Just look at the terror in the white rabbit's eyes! Sheesh!
" 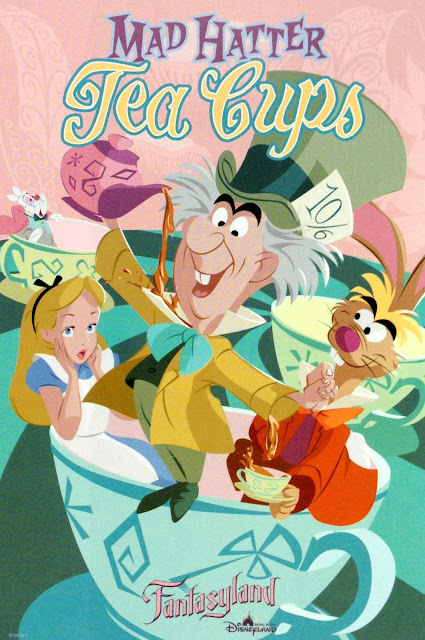 In the Mad Hatter Tea Cups poster (for Hong Kong Disneyland) I had originally drawn the White Rabbit's arms up in the air, presumably in some expression of delight and excitement. The legal department had one objection - the White Rabbit's hands were not inside the ride vehicle, which was considered unsafe behavior. I pointed out that the Mad Hatter was actually standing on the edge of the cup, completely outside the ride vehicle, pouring hot tea down his sleeve. Compared to that, I thought the white rabbit's behavior was pretty innocuous. ' Well, he's mad,' was the response. And that was that - the white rabbit's hands went back in the ride vehicle!" In the Tokyo poster, I like the way the White Rabbit seems to be trying (with his usual amount of non-success) to maintain order in a chaotic situation. But the Hong Kong version wins. It's perfect in everything from its character art to its graphic style to the inclusion of Mary Blair leaves! There's a lot I love about the WDW version--but not the inclusion of Mickey and Minnie. What the heck?